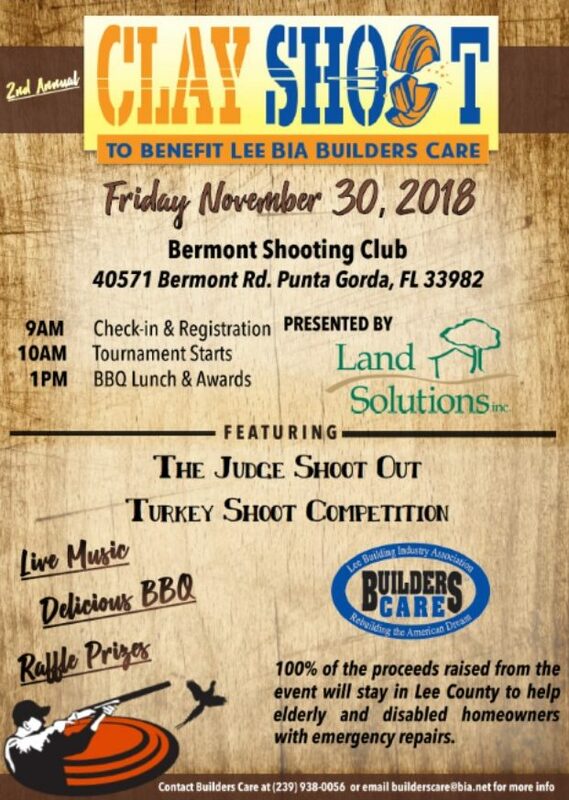 Lee BIA Builders Care, the nonprofit charitable arm of the Lee Building Industry Association (BIA) is hosting its 2nd Annual Charity Clay Shoot on Friday, Nov. 30 at Bermont Shooting Club, 40571 Bermont Road in Punta Gorda, where individual shooters and teams will navigate a 14-station course. Registration and check-in begins at 9 a.m., and the tournament starts at 10 a.m. Participants will enjoy a barbecue luncheon at 1 p.m., featuring live music, prize drawings and an awards ceremony to name the top individuals and teams. Proceeds from the event will support Lee BIA Builders Care, the nonprofit charitable arm of the Lee Building Industry Association (BIA), and its efforts to provide emergency home repairs and construction services at no cost to elderly, disabled and economically disadvantaged people who are unable to obtain home repairs through traditional means. 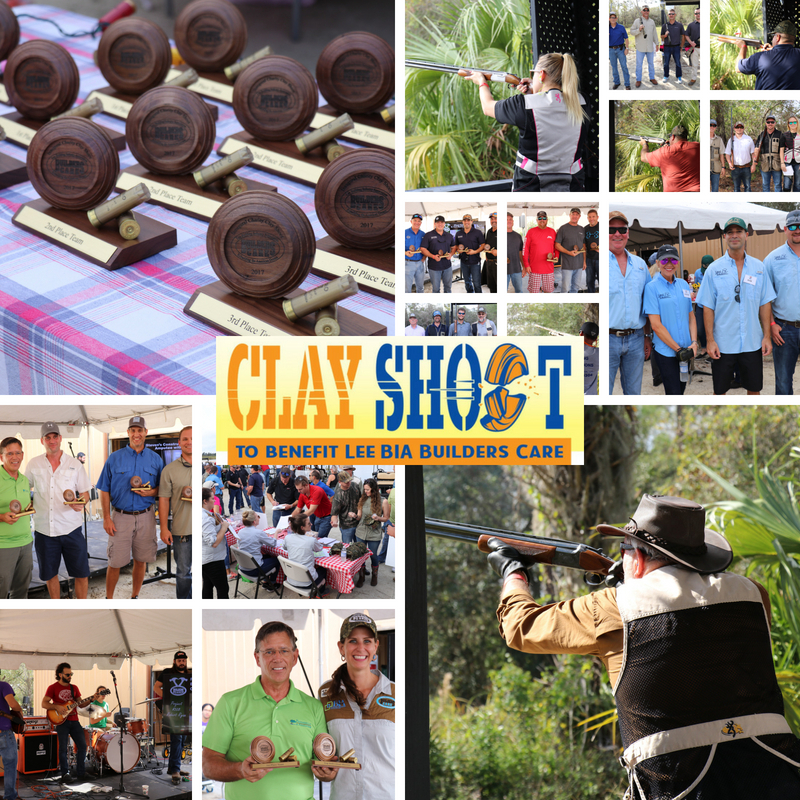 Check out photos from the 2017 Inaugural Clay Shoot! Lee BIA Builders Care is the nonprofit charitable arm of the Lee Building Industry Association (BIA). Its mission is to provide emergency construction services at no cost to needy and deserving elderly and/or disabled homeowners, and their families, who cannot obtain repairs through traditional means. To date, Lee BIA Builders Care has put more than $4.5 million in construction services back into the community at no cost to homeowners in need. Lee Builders Care enlists the volunteer services of Lee BIA members and leverages grants and donated materials to provide construction and remodeling services to qualified homeowners throughout Lee County. Lee Builders Care is headquartered at the Lee BIA office at 6835 International Center Blvd. #4 in Fort Myers. The Building Industry Association (www.BIA.net ) is a 63-year-old association affiliated with National Home Builders Association and Florida Home Builders Association that serves to strengthen our community by advancing a professional building industry through advocacy, education and services. Donations can be made online at www.LeeBuildersCare.org. More information is available by calling 239-938-0056. Follow Builders Care at Facebook.com/LeeBuildersCare or on Twitter @LeeBuildersCare.